Review of Croon, ed. 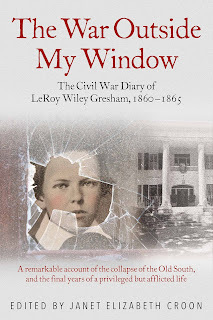 - "The War Outside My Window: The Civil War Diary of LeRoy Wiley Gresham, 1860-1865"
Born in 1847, LeRoy Wiley Gresham was just transitioning into his teenage years on the eve of the Civil War. His father was a wealthy Georgia slaveholder with two large plantations located just south of Macon, but other circumstances would doom what might otherwise have been a very promising future for the young man. Gresham, whose leg was crippled during childhood by a falling chimney and who would later suffer even worse bodily insult from the ravages of tuberculosis, began a daily diary in 1860 that only ended ten days before his death on June 18, 1865. 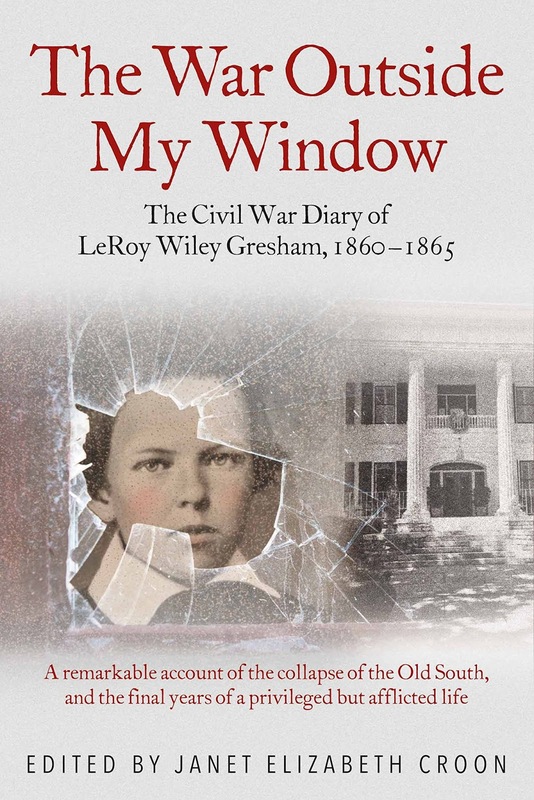 Previously available to the general public only as Library of Congress scans, Gresham's diaries have been meticulously transcribed and edited by Janet Croon and were recently published by Savas Beatie under the title The War Outside My Window: The Civil War Diary of LeRoy Wiley Gresham, 1860-1865. Gresham expresses a variety of interests in his writing, but one of the things that stands out most is how well informed he was, the outside world coming to him through multiple newspapers and a steady stream of books. Gresham limits most of his war commentary to the rumors and results of battles, passing on early casualty figures and noting which generals from either side were sacked, wounded, or lost. As an observer from afar, he was remarkably cognizant of the entire geographical breadth of the conflict. The diaries express the same level of interest and concern over tiny campaigns fought along the frontier of the Confederacy that they do with major battles in Virginia. Gresham even named his first dog after Missouri general Sterling Price. For such a young person with limited experience of the world, Gresham displays in his writings a rather mature view of the reliability of news reports. While he does repeat the typical enthusiast pattern of inflating enemy casualties and minimizing friendly losses, Gresham's first reaction to reports of victories and defeats alike is appropriate skepticism accompanied by expectation that the truth will eventually come out. In 1864, particularly during the period of Sherman's March to the Sea when the war truly was just outside his window, Gresham's war commentary becomes much more reflective and personal, his diary entries greatly increasing in length, detail, and local concern as the enemy threat to Macon and his father's nearby plantations waxed and waned. Surprisingly, Gresham mentions the preliminary Emancipation Proclamation only in passing and without comment. Even more interestingly, he doesn't mention the measure at all when it went into effect at the beginning of 1863. Perhaps his home's distance from the front and hopes of ultimate victory made the threat seem more theoretical to him than real. He also has little to say about the enlistment of black troops beyond Kentuckians being upset. Some readers will want or expect Gresham to reflect upon slavery at some length, but it should be no surprise that a youth of his upbringing might take the institution and the racially stratified social system that it spawned for granted. At one point, Gresham does express skepticism that slavery was divinely inspired. Much of Gresham's writing (especially from the pre-1864 period) consists of the type of mundane entries that regular readers of Civil War diaries and letters have come to expect (i.e. comments on the weather, health of loved ones, who's visiting, etc. ), but the young man also had stimulating hobbies he enjoyed discussing. Being unable to participate in most physical activities, Gresham indulged his mind. In addition to keeping up with some formal schooling, he was always reading books of various kinds. The game of chess developed into a great passion, and he wrote frequently about his marathon play sessions and discourses on strategy. Gresham's diaries also provide modern readers with information about wartime events and happenings around Macon, which was an important transit point for troops and prisoners and was also visited by many prominent generals and politicians (including President Davis). Gresham describes at some length the Union occupation of Macon and environs in early 1865, and notes that his father's properties, while stripped of foodstuffs, horses, and other things armies craved, were comparatively well treated by federal soldiers. Not surprisingly, the Gresham slaves left the plantations by twos and threes during this time. Gresham doesn't come across as naively attached to illusions of slave loyalty but reflections upon the revolutionary changes to the society he was raised in are generally absent from the diaries. Domestic crime not directly related to the war remains an understudied home front topic, and the book also has some interesting observations about these types of activities. At various points in his diaries, Gresham relates incidents of assault and murder in downtown Macon, a string of arson attacks on area plantations, and a robbery break-in inside his own home. He doesn't speculate (at least in his diary) on the source of the fires, though readers might recall late antebellum hysteria over well-publicized allegations that Texas slaves conspired with abolitionists to set that state ablaze, and one wonders if similar thoughts entered the minds of the Gresham household and those of local authorities. Most prominently, Gresham's diaries comprise a highly instructive, and equal parts affecting, case study (though atypical) of the course and treatment of one of the greatest health scourges of the pre-antibiotics period—tuberculosis. In addition to regularly reporting about the painful condition of his crippled leg, Gresham comments almost daily on his disease symptoms and dutifully discusses the great many drug treatments and palliative measures employed toward easing his many intractable discomforts. Parents and attending physicians both kept the diagnosis from Gresham, and the usually highly perceptive boy never openly airs his own suspicions in his diary, even though the typical signs and symptoms of consumption would almost certainly have been known to him. One suspects that there was more than a little fear and denial involved, not unusual attitudes for patients with progressively fatal diseases to display. By the crisis period of the war, Gresham would go long stretches without even mentioning his obviously worsening medical problems. By arriving at the most likely diagnosis for Gresham's condition, Pott's Disease (or spinal tuberculosis), and contributing expert medical commentary in the book's footnotes, medical foreword, and particularly informative afterword, physician Dennis Rasbach's adjunctive participation in the project was invaluable to Croon's work. In the afterword, Rasbach's summaries of the disease's natural history, standards of care, and period medicines greatly inform our understanding of what Gresham went through and the quality of care he received. In addition to transcribing the diaries, Croon (with the assistance of Rasbach and the publisher) extensively annotated the material for publication. The footnotes provide useful information on persons, places, and events mentioned in the text as well as medical insights, terminology, and other commentary essential to readers wishing to get the most out of the experience. Given the huge parade of individuals mentioned in Gresham's diaries, Croon greatly assists the reader by compiling a comprehensive 'dramatis personae' register of immediate family, slaves, friends, and extended relations. Only time will tell if Gresham's writings reach high classic status on par with those of Mary Chesnut, George Templeton Strong, and other famous Civil War diarists, but The War Outside My Window undeniably adds a unique youthful voice to the vast array of existing eyewitness accounts of the era. It is highly recommended. A very sensitive and perceptive review, Drew. What a interesting and mature diary from such a young man. I have just finished reading this book and can highly recommend it. Great information about daily life during the War. LeRoy was a wonderful observer of the events around him. You will learn a lot from this book. Dear John, Many thanks for reading this volume. I hope you will leave a review on Amazon and elsewhere. It helps a lot, and keeps independent publishing alive. Thanks for taking the time and trouble to really dig into this remarkable diary. We in the Civil War often lament that the niche is not expanding, is in fact contracting, and its readers are mostly older males. Thankfully, we are finding broad support from readers (men and women alike) outside the genre. The medical, familial, and primary source aspects of LeRoy's writings appeals to them. Jack Davis and other major historians were surprised by the value of this diary, and wondered how it escaped notice for so long. We just ordered a second printing and it has only been out one month. We appreciate your support for our program, and independent publishing in particular. We think LeRoy will be known as the young voice of the Old South. And that would be a good thing. Thank you so much for such a warm review of LeRoy's diary! He truly has, as my younger daughter (aged 28) has noted, my "third child" and this project, with the assistance of Ted Savas and Dennis Rasbach, has reached far beyond what we envisioned as I began the process of transcription. As a former high school teacher of History, I saw the potential in LeRoy's writing to engage and engross readers of his age, and am so thrilled that you have found LeRoy's voice to be as compelling as I have!